This afternoon I was involved in a competitive hunt for wild game. The competition was intense but only one of us wanted to catch the wild game to eat. 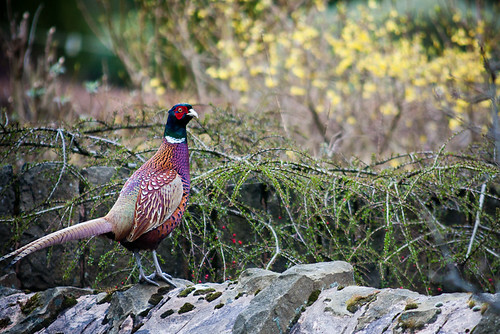 The wild game was a pheasant that happened to land in my neighbours garden unexpectedly this afternoon. My competition in the hunt? 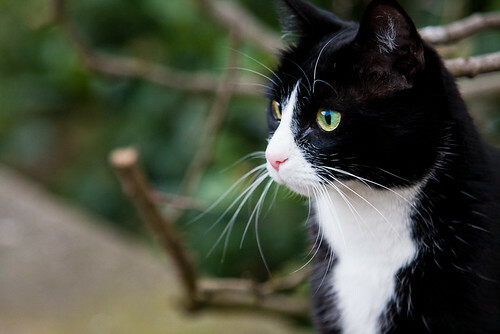 Wilson, my neighbour’s black and white cat. I was returning towards my house from putting my vegetable peelings into my compost bin when I first spotted the bird. It took me by surprise as I had never seen a pheasant in one of our gardens before (my garden and my neighbours’ gardens are only separated by low old stone walls so our gardens are kind of open plan so it is easy to notice if a strange creature enters one of the gardens). It is an OK photo but the background is too busy for my liking. Ideally I would have liked him to stood somewhere with a blank background behind him. So I needed him to move into a better position. Luckily for me he then decided to hop round to the front of my neighbours house which I hoped would lead to a better background. So like a good hunter I followed him round to the front. Wilson of course likes to think of himself as the master hunter so he wasn’t far behind. I rushed round the front of my neighbours house one way while the bird and his feline hunter went round the other way (I had to take the route through my garden rather than invading my neighbours land like Wilson was only to happy to do). I got to the front of the house and tried to get a closer shot of the bird but some bushes got in the way. Again I didn’t want to walk into my neighbour’s front garden so I waited for the pheasant to hop further towards me. He started to and it was at this moment that Wilson decided that it was now or never and he made his move. In an instant he leapt towards the pheasant and almost grabbed him. But the bird managed to get free and flew away into the woods. I tried to capture the moment but I missed it which is a shame. The view was partially covered by a bush so it wouldn’t have been a brilliant shot anyway. So neither I or the cat got what we really wanted. I didn’t manage to get a close up photo of the bird with an unobtrusive background. And Wilson missed out on dinner. Next week join me as Wilson and I hunt an antelope or zebra…..